I've been a negligent blogger lately. Just too much going on, I can't complain though. 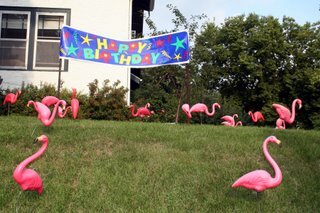 BioMom turned 40 a few days ago and we awoke to find 40 flamingos in the front yard. I received a negative review from a second rate journal for the fourth time on a paper that I started seriously working on in 2001. Sometimes I wish that I had a job in which I saw projects from start-to-finish within a period of a few days. One of the critiques was that I did not have a clear intuitive explanation for one the statistics that I was producing. or the other indexes have a neat summary intuitive explanation either. Too bad I can't forward this email to the anonymous reviewer. My coauthor and I promptly readdressed the paper and sent it to a different journal. Oh, and Big grew two top teeth. Painfully, loudly, sleeplessly, they stretched their way into his gums. I am totally out of my mind envious! 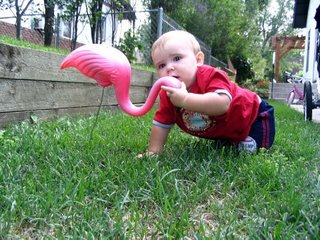 I so love flamingos but every time I buy some my kids remove them from the yard (which can't even be seen from the road) and lecture me on the tackiness of Plastic Pink Flamingos. I so would decorate my bedroom and master bath in Pink Flamingo Decor but I have been told that my Interior Designer daughter and son-in-law would have STROKES if I went through with it. Your picture reminded me of my days working in a party shop (before ascending to acadmic glory!). I was the one who went to people's houses in the middle of the night and put out those flamingos (and other exciting lawn ornaments). It was really cool, but I was always worried I was going to get mistaken for a burgler and shot as I skulked around a yard at two in the morning. 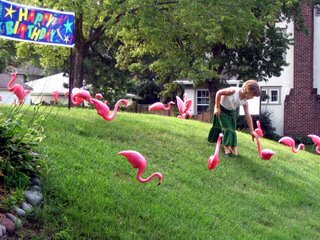 My boyfriend convinced me that having my hands full of flamingos and driving a Party Town van would probably convince a police officer I was truly not a criminal. 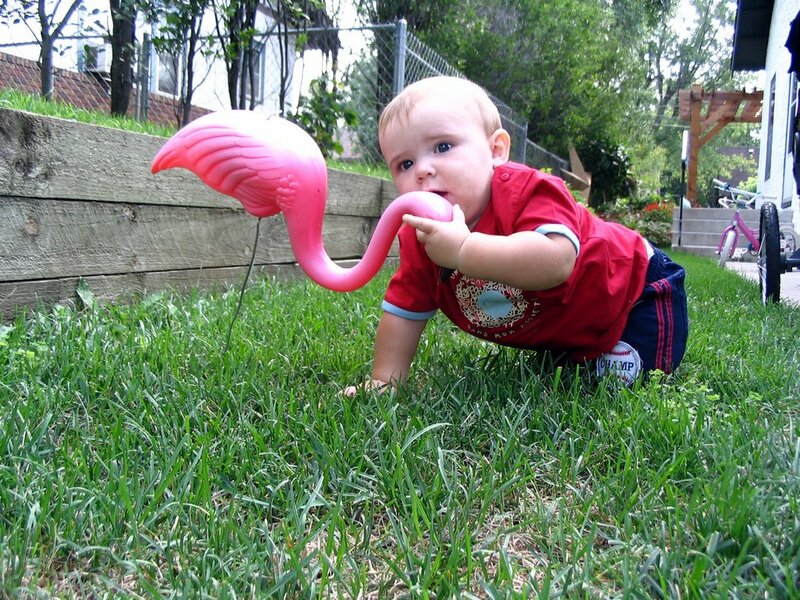 Good luck on the teething!